to Multiply your English Word Power! 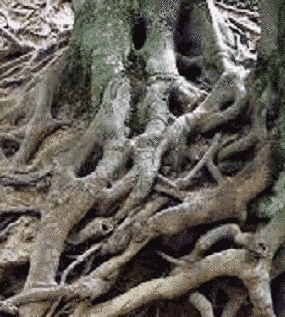 Learning the most common word roots (and a few prefixes and suffixes) will help you recognize or at least guess at thousands of these academic words. This will help you do well on tests, in college courses, and in business. You will also find English reading more enjoyable. It’s a fascinating study! 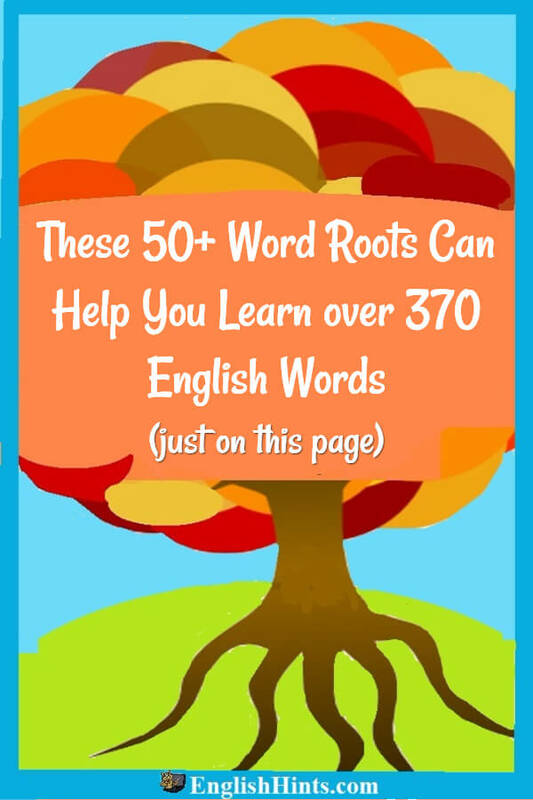 The list below includes over 50 Latin word roots, each with a few examples of the English words that come from it. Look at the prefixes and suffixes attached to each word root, and see if you can guess the English meaning. The list begins with a demonstration of how prefixes can be added to a root to change the meaning, using the root 'mittere,' since it takes so many prefixes.. If you already understand prefixes fairly well, and would like to go straight to the 50+ word list, click here . transmitter, n.-- a machine that sends electrical signals across distances. caedere-- to cut (often -cis) or kill (-cide): concise, decisive, homicide, imprecise, incision, indecisive, precise. clamare-- to shout: acclaim, clamor, exclamation, proclaim, reclaim. claudere-- to shut or close: conclusion, exclude, inclusive, inconclusive, occlude (to close off a passage like an artery), preclude. reclusive, secluded. clinare-- to lean: decline, disinclination, inclination, recline. crescere-- to grow: crescendo, decrease, increase, increasingly. currere- to run: concurrent, courier, currently, cursive, cursor, cursory, incur, occur. durare- to harden or to last; durus-- hard: arduous, durable, endurance, unendurable. facere-- to make, factus, made (often becoming fectus when joined with a prefix. Facere also becomes the suffixes -ify, -ificial, & -ification in English): affect, artificial, classification, codify, diversify, edification, effect, efficiently, factor, factory, identify, infect (make someone sick), justification, perfect, proficient, simplify, specific, superficial, verify. Negatives from facere: disaffected (affected negatively), unaffected (not affected at all), declassify, defective, unedifying, ineffective, inefficient, unidentified, unjustified, imperfection, unspecific, unverified. ferre-- to bring/carry: conference (bring together), defer, differentiate, inferred, refer, transfer. finis-- limit or end: confine, definite, definition, final, finite, finish, infinity. firmare-- to make firm: affirm, confirmed, confirmation, firmly, infirm. fligere-- to strike (hit someone): afflict, affliction, conflict, inflict. fluere-- to flow: affluent, confluent, effluent, fluency, flux, influential, influx, reflux. formare- to form: conformity, deform, formalize, format, formation, inform, nonconformity, reformer, transform, unformatted, unformed, unreformed. fundere-- to pour or melt: confusing, diffuse, fuse, fusion, infuse, profuse, refusal, transfusion. gradi-- to step; gradus-- a step: aggression (neg: nonaggression and nonaggressive OR unaggressive), biodegradable, congress, degradation, degree, digression, grade, graduation, progress, regressive, retrograde, transgression, unprogressive. gregare-- to herd (form groups): aggregate, congregation, desegregation, gregarious, segregation. haerere-- to attach or stick: adhere, adhesive, cohesion, incoherent, inherent. integrare-- to make whole: disintegrate, integer, integral, integration, integrity. jactare-- to throw: conjecture (an idea thrown out to see the response), dejected, eject, inject, objective, project, projector (machine that throws a picture forward), rejected, subject to, trajectory. jungere- to join together: adjoining, conjoined, conjunction, disjointed, joint, junction. laborare- to work: collaborate, elaborately, labor, laborer, laborious. legis, lex-- law: illegal, illegitimate, legal, legality, legislation, legislature, legitimate. locus-- place: allocate, collocation, local, locate, location, relocation. plicare-- to fold: complicated, duplicate, duplicity, explicit, implication, implicit, implies, multiply, uncomplicated. rectus-- right, regere- to lead straight or to rule: correct, correction, deregulation, direct, erect, incorrect, irregular, rectangle, rectify, regular, regulate, unregulated. rumpere, ruptus-- to break, broken: abrupt, corruption, disruptive, erupt, incorruptible, interrupt, rupture, uncorrupted, uninterrupted. securus-- safe: assure, assurance, ensure, insecure, insurance, reassure, security, sure. sequi-- to follow: consecutive, consequences, inconsequential, sequel, sequence, subsequently. servare-- to keep or protect: conservation, observe, preservation, reserve, reservoir. signare-- to mark or make a sign: assign, design, designate, insignia, insignificant, resign, sign, signal, signature, significant, unassigned, undesignated. sistere-- to place or take a stand: consistent, existence, insist, persistent, resist, resistance. spirare-- to breathe: aspiring, conspire, expired, inspiration, perspire, respiration, transpire, unexpired, uninspiring. statuere-- to put or set: constitutional, institute, institutionalize, restitution, substitute. struere-- to build: construction, destructive, instructions, obstruct, reconstruct, structure. terminus-- end, boundary: determine, exterminate, terminal, terminate, terminology. testari-- to bear witness: attest (to), contest, testify, testament, uncontested. tribuere--to pay or divide among: attribute, contribution, distribute, retribution, tribute, tributary, unattributed. turbare--to trouble or cause disorder: disturb, disturbance, perturbed, turbid, turbulence. English Words from the Latin Root Ponere . To keep this list from being too long, I skipped many common roots you might already know. See if you can think of any words from the Latin root bases lun- (moon), manu- (hand), sol- (sun), stella- (star). There are also many common words from Greek roots.